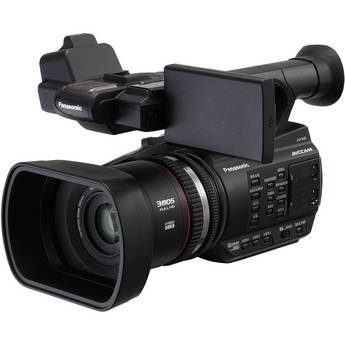 NEWARK, N.J., Jun 19, 2014 (BUSINESS WIRE) -- Panasonic has announced a new professional AVCCAM® HD handheld camcorder, the AG-AC90A, with significant improvements over its predecessor, the AG-AC90. Advances include two new recording options -- a PM mode (1280x720, 8Mbps) supporting sports analysis applications and a CS mode (720x480, 3.5Mbps) for cloud service utilization. Other enhancements comprise the ability to copy content from one SD card to another, a date and time superimpose function ideal for law enforcement and legal depositions, Freeze Frame (still picture) on video out during shooting position change, Eye-Fi card support, a Variable White Balance function, additional marker displays, and a Digital Range Stretch (DRS) On/Off user button. Current AC90 owners can access these new features via a free firmware upgrade available at http://pro-av.panasonic.net/en/index.html . The AC90A is a full-featured model that establishes new benchmarks for professional entry-level acquisition. Features inherited from the AC90 include a high-quality 3MOS/BSI sensor; a highly-accurate 12X zoom lens with three independent adjustable rings for zoom, focus and iris and wide 29.8mm to 357.6 mm (35mm equivalent) viewing angle; and Panasonic’s exclusive Nano Surface Lens Coating that reduces ghosting and flares . Other key features include two SD Memory Card slots; a five-axis image stabilizer that dramatically improves stabilization for hand-held shooting; 4X pixel shifting technology for a sharper image; and an intelligent Auto (iA) Zoom 25X super-resolution function for automatic adjustments of edge, gradation and detail. For more information on Panasonic professional video products, visitwww.panasonic.com/broadcast . All brand and company/product names are trademarks or registered trademarks of the respective companies. All specifications are subject to change without notice. Information on Panasonic solutions for business can be obtained by calling 877-803-8492 or atus.panasonic.com/business-solutions/ . Panasonic Corporation of North America provides a broad line of digital and other electronics products and services for consumer, business and industrial use. The company is the principal North American subsidiary of Osaka, Japan-based Panasonic Corporation, and the hub of Panasonic’s U.S. branding, marketing, sales, service and R&D operations. In Interbrand’s 2013 Annual “Best Global Green Brands” report, the Panasonic brand ranked number four, the highest ranked electronics brand in the report ( http://bit.ly/17ezCDI ). As part of continuing sustainability efforts, Panasonic Corporation of North America relocated its headquarters to a new facility built to meet LEED certification standards, adjacent to Newark Penn Station in Newark, NJ. Learn more about Panasonic at www.panasonic.com .